You are busy with a big project at the moment and concerned about its outcome. There is a person in your life whose name starts with an S and this person has a big influence on you. You are concerned about financial matters…. You’ve seen the little caravan and crystal ball at the carnival…. You’ve walked down St George’s Mall and received a mini-flyer from the herbalist (not the Cash for Gold ones- check before you throw them away ne)… and you’re wondering what your future holds… maybe a visit to the dude in the bookshop in Long Street who read palms… or the dude reading tarots at the Antique Market…. Maybe the psychic in the alley in Kalk Bay. But how to know whose legit or not??? Is that the question? Well… what if I told you it’s impossible to predict the future… for anyone… I don’t care how psychic you are… and please … please… prove me wrong. In my humble little opinion- these “psychics” just read you as a person, make a coupla vague statements and state the obvious (well not obvious to the ignorant that is). Oh man! cumon! !… who does not know of a person whose name starts with S???... think about it and you’re always busy with some project. I say nobody has this supposed miraculous ability to tell the future. Instead, it’s a mixture of the art of reading people, looking for patterns and some guess work in between. Instilling some positive thoughts for you to focus on and vwala!! … you find love, money and the career. And if it doesn’t quite happen that way- maybe the stars moved two degrees left. 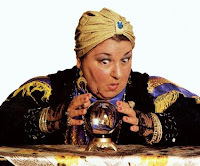 If there is a person who can predict your future…. its you! With every thought and action… you create your future. There’s no miracle about it- that big ship doesn’t exist… neither does that miraculous event or person that will make it all alright. Its all about you, what you think and believe is possible and what you do about it. The what you do about it part is most vital. I believe there are seen and unseen forces at play in our lives- some we have an influence on… others not. Through our thoughts and actions- we control those things we have some influence over. The rest I’m afraid is Que Sera Sera people. How can anyone else think and act for you? How can anyone else tell you your future. And And And….. has anything ever… ever… turned out exactly as you envisioned?... exactly as foretold? I loved this one Mo..Itz so true I totally Ditto it start to finish.. I Believe in "YOU ARE YOUR THOUGHTS AND ACTIONS". That's why I try my Utmost to always think happy thoughts..It does not always work, but it always outweighs the Negative thoughts. You must have a Sunshiny week further.